Help, I cant find it! Lifetime warranty on all powerhead overhauls. Check it out! Should you not see what you are looking for, use the "Cant find it" button in the menu on the left. For single use with nearly any engine. Feels natural in every function. Precise, smooth postive action. Ergonomically designed handle w/Soft Touch Grip. Intuitive positioning of all features. Trim switch with positive snap action feel. Trim in handle, push button warm- up, neutral interlock prevents starting in gear. Accepts virtually every type OEM & 3300-type cable, including Mercury Gen II. Side mount control box for motors equipped with power tilt/trim. 15' harness and built in warning horn. 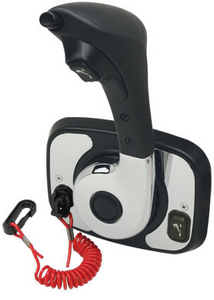 Concealed panel mount control box for outboard motors with integral power trim. 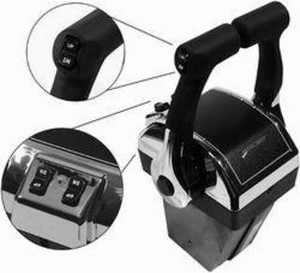 Concealed panel mount control box for sterndrive motors (Mercruiser) with external trim cylinders. 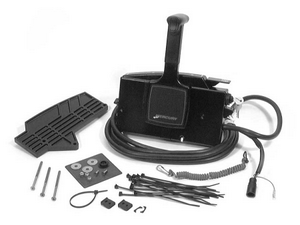 Gen II Single engine top mount control box. Trim switch in handle. Comes with 2' trim harness with traditional 3 blade Mercury connector. For use with Mercury/Mariner outboards with integral trim. 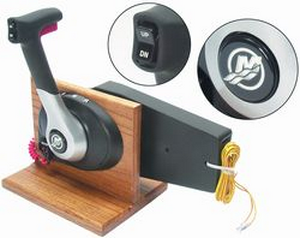 Gen II dual engine top mount control box. Single trim switch in handle simultanious dual engine trim buttons in cover. For Mercury/Mariner outboards with integral trim. 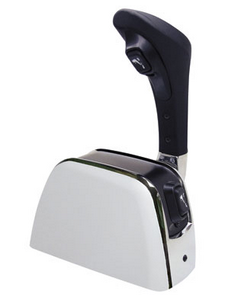 Single Lever, Side Mount Control Box with Trim, Focus on ergonomics in every detail. The result is an engine control which is rugged and substantial, yet feels natural in every function. 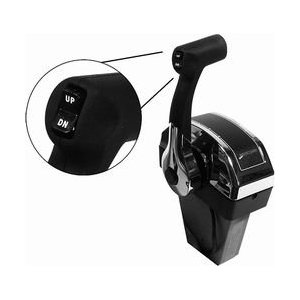 Shift and Throttle in one handle. Chrome handle, Black cover w/chrome and black inserts. Netural safety switch standard, I/O and O/B stop switch. Suits 33C-type, OMC and Mercury control cables. You are on page 1 of 3 available pages for your selected item.